A bassist with a solid reputation, an award-winning composer-bandleader, and a devoted world-class educator; Barcelona-born Alexis Cuadrado has become one of the most sought-after musicians on the New York jazz scene. In 2008 he was awarded a Chamber Music America “New Works” grant that led to the creation of his new epic recording, Noneto Ibérico, successfully premiered in October of 2009 to critical acclaim, and featured on WNYC's "Soundcheck” with host John Schaefer. Noneto Iberico will be released on CD in February of 2011. Cuadrado has three other CDs as a leader: Puzzles (Brooklyn Jazz Underground Records, 2008), Visual (Fresh Sound New Talent, 2004) and Metro (FSNT, 2001), which include original compositions and have received enthusiastic reactions from critics and fans alike. 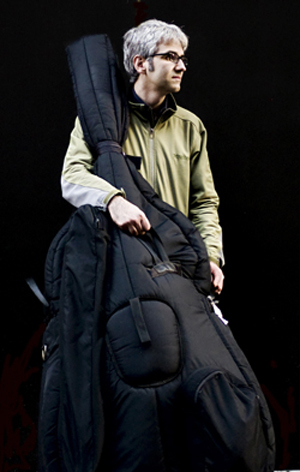 He has excellent credits as a sideman, with over twenty recording appearances and performances with such greats as Kurt Rosenwinkel, Bruce Barth, Ben Monder, Perico Sambeat, Mark Turner, Ben Waltzer/Bill McHenry Quartet, Steve Wilson, Seamus Blake, Grammy Award winner Angelique Kidjo (with whom he recently performed at Carnegie Hall), amongst many others. He currently keeps busy freelancing with multiple groups in New York, the US and Europe. Nonteo Ibérico features: Perico Sambeat (saxophones & Flute), Loren Stillman (saxophones), Avishai Cohen (trumpet), Alan Ferber (trombone), Brad Shepik (guitar), Dan Tepfer (piano), Marc Miralta (percussion), Mark Ferber (drums), Alexis Cuadrado (bass), with VERY special guests: Israel Suárez "Piraña"
, Tomás Moreno "Tomasito", Blas Córdoba “Kejío” on flamenco handclaps and "Jaleos". Noneto Ibérico is Cuadrado’s fourth CD as a leader and the follow up to his much-lauded recording, Puzzles. “Noneto Ibérico”, which saw its successful premiere in October, 2009 at NYC’s Jazz Gallery, is a nine-movement piece performed by nine musicians, blending the traditional song forms of Spanish Flamenco music with the contemporary improvised music idiom, creating a unique and groundbreaking genre that goes a step beyond previous blends of flamenco and jazz. Noneto Ibérico was released March 2011. Besides Mr. Cuadrado on double bass, the ensemble featured on Noneto Ibérico includes some of the most outstanding jazz musicians on the New York scene: Avishai Cohen on trumpet, Loren Stillman on saxophones, Alan Ferber on trombone, Brad Shepik on guitar, Dan Tepfer on piano and Mark Ferber on drums, with the special collaboration of two of the most exceptional musicians in Spain that have broken molds, and are renowned internationally for blending jazz with Flamenco, Perico Sambeat on saxophone and Marc Miralta on percussion. Together they construct a bridge that brings the composer's cultural legacy to bear on American jazz, thus enlightening the contemporary musical experience. Cuadrado has researched deep into the roots of Spain's Flamenco music, extracted its bare-bone elements and reconstructed them. Cuadrado explains, “Around 4 or 5 years ago, I just became obsessed with Flamenco music. I started listening to a ton of it, studying, transcribing, playing along with recordings. I formed a trio to play some of the repertoire and called it Trio Iberico. Suddenly I got a Chamber Music America grant through their “New Works” grant program (final funding for this project came from a successful Kickstarter funding campaign) to write a Flamenco-jazz piece for a nine piece band. And that's what this music is, Noneto Iberico!.” The stunning result is a series of pieces that create a completely new aesthetic in the contemporary American jazz panorama. The bassist/composer based each one of the pieces of "Noneto Ibérico" on a specific flamenco song-style (known as "Palo"). Every Palo has its own complexities and idiosyncrasies: a specific form, rhythm, harmony and melodic twists that have to be faithfully respected in order to be considered authentic. Every movement in the "Noneto Ibérico" suite achieves this, but Cuadrado also draws resources from other musical sensibilities in addition to his native-flamenco vocabulary. His experiences as a composer and performer in a wide variety of contexts, from jazz, world music, chamber music, as a sideman with Angelique Kidjo, playing 24 hour parties in gypsy wedding bands, and more, have left an indelible impression on Cuadrado. Some of the results include the piece "Por La Mínima", which mixes the elements of the flamenco "Bulerías" with those found on minimalist music. The melodies of the "Soleá”, titled "Sólo El Sol Sale Siempre Solo", are based on serialism, and the "Alegrías" "Tocar y Parar” utilize baroque counterpoint motives. Alexis Cuadrado’s 3rd CD, was an important step forward in the Barcelona-born bassist and composer’s career. Not only did he write and arrange the album’s music, but the project is wholly self-produced. special guests: Israel Suárez "Piraña"
, Tomás Moreno "Tomasito", Blas Córdoba “Kejío” on flamenco handclaps and "Jaleos"